In Ancient Egypt a couple of two professional women in the role of Isis and Nephthys were actively involved in the dead’s resurrection. They appear usually at both ends of the coffin, during the Opening of the Mouth Ceremony or, from the New Kingdom, kneeling and offering two globular vases nw at the end of that funerary ceremony. 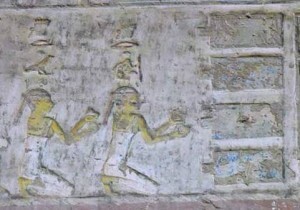 The scene belongs to the final of the funerary ceremony. That is, when the deceased is reborn after the reviving rites; he seats in front of the offering table in the verge between the Hereafter and the table with the funerary offerings. 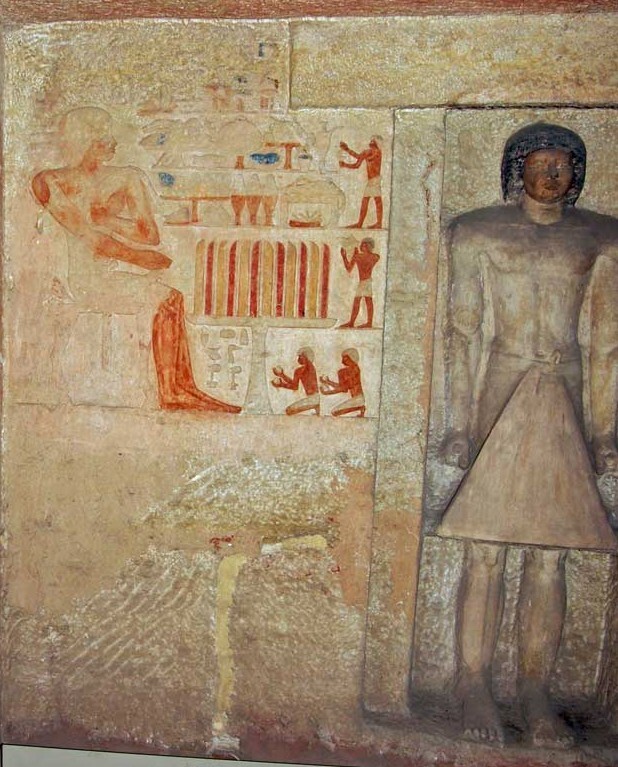 The scene is located in the funerary chapel, next to the image of the deceased. The rites for recovering the mummy took place presumably into the tomb, and concretely in the chapel. So, we could be facing a summarised version of the reviving rites, that is, an allusion to the Opening of the Mouth Ceremony. 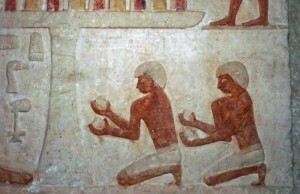 Summing up, the two kneeling figures at the end of the funerary ceremony would not be a typical scene from the New Kingdom, but it was already from the Old Kingdom in the iconographical corpus of Ancient Egypt. The question now is: why two men instead two women? Were they in charge of a mourning ritual?